This B&H Kit combines the QNAP TS-453Be 4-Bay NAS Enclosure with four Seagate 10TB IronWolf 7200 rpm SATA III 3.5" Internal NAS HDDs for a total storage capacity of 40TB. Built for office and home environments, the TS-453Be 4-Bay NAS Enclosure from QNAP features a simply physical design with a PCIe 2.0 x2 slot that can be fitted with a QNAP QM2 expansion card for M.2 SSD caching/10GbE connectivity and support for Qtier auto-tiering technology, or a compatible wireless card to turn this NAS into a wireless access point. It also supports dual-channel 4K H.264/H.265 processing to provide a smooth media viewing experience on connected devices. In addition, a wide range of productivity tools are available for use on the TS-453Be to improve work efficiency for media creators or creative professionals, while also enriching their multimedia experience. Network connectivity is achieved using two Gigabit Ethernet ports. When both ports are used simultaneously, read speeds and write speeds can reach 225 MB/s. Encrypted transfers also deliver read and write speeds of up to 225 MB/s, and when equipped with a 10GbE card, sequential throughputs with dual ports can drive read speeds up to 659 MB/s and write speeds up to 648 MB/s. This 4-bay enclosure natively supports 3.5" SATA III hard drives, and 2.5" hard drives and SSDs are also supported using included 2.5" drive flat head screws. Using the five 5 Gb/s USB 3.0 Type-A ports, this QNAP NAS can be connected to other devices, including a UX-800P or UX-500P expansion enclosure, allowing you to easily transfer large media files and expand NAS storage. Additionally, the TS-453Be is validated with AES-NI and FIPS 140-2 AES 256-bit encryption, helping to prevent sensitive business data from unauthorized access and breaches. QNAP has also engineered this NAS to also support RAID 0, 1, 5, 6, and 10, each which offers data redundancy, performance, or a combination of both. For those who do not require a RAID, JBOD and single disk modes are also available. Included is a 90W AC adapter that runs using 100-240 VAC, a power cord, twelve flat head screws for 2.5" drives, and two Ethernet cables. Protection is provided by a limited 2-year warranty. With PCIe expansion, the TS-453Be provides flexibility in extending NAS functionality and potential applications. Install a QNAP QM2 card to provide M.2 SSD caching/10GbE connectivity, or use the TS-453Be as a wireless access point by installing a compatible wireless network card (ex. QNAP QWA-AC2600), or boost USB connectivity of the TS-453Be by installing a 10 Gb/s USB 3.1 Gen 2 card (USB 3.1). Powered by a 1.5 GHz Intel Celeron J3455 Quad-Core processor (burst up to 2.3 GHz), 2GB of DDR3L RAM (up to 8GB), dual Gigabit LAN ports, and supporting SATA III 6 Gb/s hard drives, the TS-453Be provides dependable performance of up to 225 MB/s read/write speeds. The TS-453Be features Intel AES-NI hardware-accelerated encryption to drive transfer speeds of up to 225 MB/s with AES 256-bit encryption for both full NAS volumes and shared folders, boosting system performance while ensuring the security of sensitive data stored in the TS-453Be. Snapshots help protect your data by fully recording the NAS system state and metadata. If a file is accidentally deleted or modified, you can use snapshots to quickly restore the file to its previously recorded state. QNAP snapshots are block based and only record the changed data. Not only does this save storage space, but also reduces the time required to back up and restore data. The TS-453Be supports up to 1024 snapshots per NAS and up to 256 snapshots per volume or LUN. QNAP 10GbE/NBASE-T unmanaged switches allow you to instantly upgrade your network environment at a cost-effective price. With a 10GbE network, you can enjoy fast transfer speeds, empower bandwidth-demanding tasks like virtualization, and enable simultaneous real-time access to large NAS-based files using multiple workstations (good for video editing and multimedia). QNAP also provide a 10GbE PCIe network expansion card for the TS-453Be and Windows/Linux systems to take advantage of high-speed LAN environments. Featuring 9th Generation Intel HD Graphics, the TS-453Be supports dual-channel 4K H.264/H.265 hardware decoding and real-time transcoding, allowing you to convert videos to universal file formats that can be played on multiple devices. Therefore, you can easily share movies and videos stored on your NAS with family and friends for their enjoyment on a range of devices. The QNAP RM-IR004 remote control (sold separately) can be configured using QButton to customize the actions of individual buttons, providing a more convenient NAS experience. Note: The TS-453Be's hardware provides H.264/H.265 hardware decoding, encoding, and transcoding capabilities. However, playback quality may vary due to factors including playback software, file formats, system usage, and available bandwidth. QNAP provides a wide range of multimedia applications for you to easily enjoy photos, music, and videos. QVHelper allows users to stream media files or music playlists from a QNAP NAS to VLC player and Qmedia allows music, photos, and videos to be streamed to Android TVs or settop boxes. Video HD is a free KODI add-on that combines KODI's streaming and video decoding capabilities and fully supports Video Station's features. The app-driven QTS operating system provides solutions for simplifying file backup, management, search, and more. With File Station, you can view and manage your files not only from the NAS, but also from multiple storage devices; the OCR Converter allows you to extract text from images; Qfiling helps automate file organization, and Qsirch helps quickly find files. With integrated data backup, restoration, and synchronization, Hybrid Backup Sync helps you easily backup or synchronize data on the TS-453Be to other QNAP NAS, USB storage (one touch copy), or cloud storage. With Qsync, you can also access your NAS files from desktops, laptops, or mobile devices connected with the TS-453Be. Virtualization Station allows you to run multiple Windows, Linux, UNIX, and Android virtual machines on the TS-453Be. You can use Virtual Network Computing (VNC) through a browser to manage the VMs. Virtualization Station is made for organizations to run multiple applications on a single NAS. Container Station integrates LXC and Docker lightweight virtualization technologies. You can download apps from the built-in Docker Hub to easily import/export container apps and manage access control, enjoying the benefit of easy installation, transferability, and high-efficiency. QNAP NAS now supports the popular 360° panorama recording format. By clicking the 360° panorama display button, these photos and videos will be displayed as 360° panorama media files. The QNAP mobile apps Qfile, Qphoto, and Qvideo also support 360° format viewing. QNAP's QVR Pro surveillance solution allows you to arrange a dedicated, independent storage space for surveillance data on TS-453Be and leverage the advantages of scalability and storage manageability from QTS. With QVR Pro, camera management, storage space allocation, camera live view, and playback become more user-friendly. You can also use QVR Pro Client's mobile app to monitor anytime, or use a USB webcam as an ONVIF network camera with the QUSBCam2 app. Surveillance Station provides an intelligent video management system to assist in managing real-time monitoring, video & audio recording, and playback with a wide range of customizable settings to safeguard your physical environment. You can use the Vmobile mobile app to manage the monitored channels, or install the Vcam mobile app to turn your device into a network camera to instantly record to your NAS. Connect a UX-800P or UX-500P expansion enclosure and use the QTS Storage & Snapshots Manager to handle NAS capacity expansion. Designed for use in 1-8 bay NAS environments within home, SOHO, and SMB environments, the 10TB IronWolf 7200 rpm SATA III 3.5" Internal NAS HDD from Seagate is built to withstand 24x7 operations, or 8760 hours per year. This 10TB drive has been equipped with a SATA III 6 Gb/s interface, a rotational speed of 7200 rpm, a 3.5" form factor, and a 256MB cache, providing users with an ample storage capacity and data transfer speeds of up to 210 MB/s. 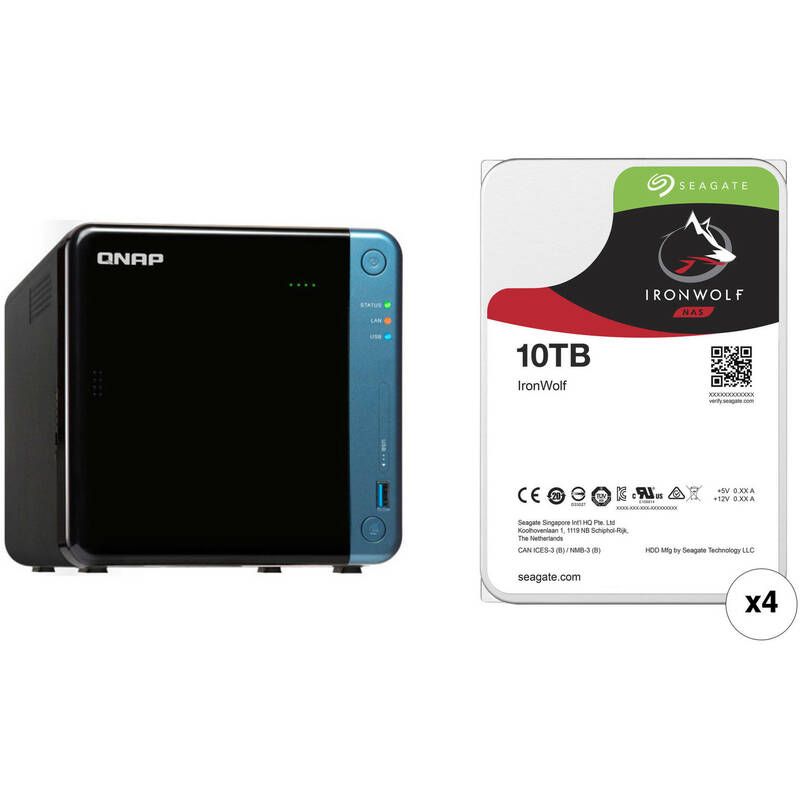 This IronWolf hard drive also has an MTBF rating of 1 million hours, 600,000 load/unload cycles, 1 in 1015 non-recoverable read errors per bits read, and a workload rate of up to 180TB per year. Protection is provided by a limited 3-year warranty. Number of Bays 4 x 2.5"/3.5"
Box Dimensions (LxWxH) 12.6 x 12.0 x 9.8"
Box Dimensions (LxWxH) 7.9 x 6.0 x 2.5"